If you’re armpit-deep in the holiday show/market season right now, it may feel like there is precious little relief for you until January 2nd. But all is not lost. Keep reading. 1. Begin planning for next year – WHAT? That’s crazy talk. Yes, yes. I know how it sounds. You’re scurrying around trying to finish making pieces for customers NOW. You have tables and displays to set up. Mailing lists to update. But making notes for a new future strategy can really take your mind off the chaos in front of you. A subtle mental shift is all that it is, but reframing “OMG, I’m never going to survive this holiday season” into “I’ve made some mistakes this year, but here’s what I’m doing differently next year…” can give you back a feeling of control. 2. 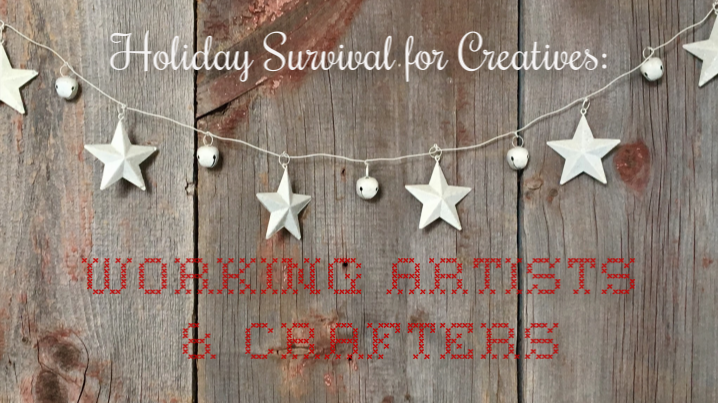 Enlist help – Seems obvious but I’m always shocked at how many artists and crafters are slaving away at way too many tasks while family and friends stand obliviously by. Sure, they can’t take over your creative work, but they can cook a meal, watch the kids, clean the kitchen, etc. And what about help for shows/holiday markets? I don’t do craft shows or holiday markets anymore, myself, but – although I’m plenty busy this time of year – I don’t mind pitching in for other maker friends. I’ve manned the show table, run errands and brought lunch so other makers can keep making. I’m sure you have someone in your life who is willing to help. All you gotta do is ask! 3. Be realistic – You’ve booked a holiday show every weekend from Thanksgiving until New Year’s, you say? And you’re not going to have enough of your work to take to all of them, so you’re staying up all night every night for 30 days to paint, stitch, hammer or glue? A.) Take a look at points #1 and #2 above. B.) Now take a deep breath. C.) Now rationally decide what you can actually accomplish. Yep, the last show might be a flop. Or maybe you have to walk away from the one you sunk least amount of money into. But, honey, you’re a human, not one of Santa’s elves. It’s tough love, but stepping out of the holiday haze and being harshly realistic with yourself can actually be a huge relief.